Aqua Lung is a legendary name in underwater equipment, having produced the first diving regulator to reach worldwide popularity after it was developed by Jacques-Yves Cousteau and Émile Gagnan in 1943. The company continues to represent a standard of quality in scuba equipment. Dive computers are one of the most helpful advances in the field, and it’s no surprise that Aqualung has a diverse selection of highly regarded models. In this article, we’ll review a selection of their dive computers, including a new unit just coming to market. Dive computers have become popular in scuba diving for their ability to make the experience safer and more convenient. These high-tech devices monitor and centralize data such as dive total time and time remaining, depth, mixture status—and handle the calculations that experienced divers have been doing for decades. Considering the volume of metrics and ongoing computations necessary for a safe trip, dive computers represent an almost revolutionary advance for both recreational and technical users. There are a few critical factors that go into the decision. You will want to evaluate price and aesthetics, but these are personal preferences. The most important qualities to consider for a recreational dive computer are reliability and convenience. It’s not necessary to acquire every feature to gain a lot of benefit from these handy devices. Safe diving is the utmost priority in scuba gear. You need to be able to rely on your equipment. This is why brand manufacturers are so important in diving: you want the experience and quality that come with a well-regarded name. Recreational diving should be as safe as possible, but the motivation is enjoyment and discovery. Regardless of your experience level, you want a dive computer that is straightforward to setup, intuitive to learn, and easy to operate. No diver at any level wants to fight with their equipment. Finding the right dive computer begins by answering some questions about your needs. Q: What is your experience level? It may seem that high-end automation is the way to go for beginning divers, but that’s not always the case. 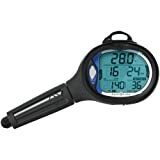 A good dive computer helps monitor your equipment and perform the calculations needed for a safe dive: but it is not necessarily a beginner’s tool. Too many options and information streams can cause overload and, ideally, newcomers should learn about sound diving practices before automating them away. Q: What kind of diving trips do you plan? The dive you’re making determines the equipment you need. You want appropriate complexity and useful scope–not blinking, beeping overload. If you intend to make long, technical, deep dives, you will require precision and sufficient monitoring to handle decompression times and other limits. Even the most occasional recreational user benefits from automated tracking and alarm signals. It’s good to have a pocket buddy—though it doesn’t replace a real one. Q: What are your technical requirements? Your equipment dictates the computer you need. Wireless air integration is a convenience, for example, but some divers still swear by their console gauges. If you use a rebreather, your computer should be able to track your gas mix and offer a reliable bailout system. On the other hand, if you’re only interested in shallow recreational diving, you don’t need—or want—to have enough computational power for the space program on your arm. While many features of dive computers are widely useful, some are reserved for specific diving practices … and some are mere preferences. Dive computers can be console-mounted, but recent technology allows for miniaturized systems contained in a wrist-mounted unit. Such wonders come at a cost, but it’s hard to beat the convenience. Also, the coolness factor is definitely in play with watch-sized units. The operating mode is set according to the dive you plan. The 4 basic modes used by Aqua Lung are Air, Nitrox, Gauge and Free Dive. Some specialized units offer other gas mixes such as Trimix. The Air setting is based on the natural profile of air (21% oxygen), and is the main mode for recreational diving. Nitrox mode allows you to choose the gas mix, for which the computer will adjust its algorithm. Free dive mode provides more frequent sampling. You can swim up and down as much as you’d like, as the computer keeps you within table limits. The Gauge Mode turns off the fancy computations and just gives basic information about your depth and submerged time. Many dive computers have a basic two color display, but there are an increasing number of full color models coming to market. Thin Film Transistor (TIF) technology makes a vivid color display, but be aware all that beauty eats batteries and can be hard to see in sunlight. An intuitive layout is important, and you want a coherent menu system with nice-sized buttons. Buttons can get very small when wearing gloves. Dive computers are battery powered, and some models require the user to mail their camera off to have its battery replaced. This is rather a pain, especially when there are user-replaceable models that take rechargeables. If keeping dive logs is important to you, make sure you get a unit that automates downloading onto your preferred device. It saves you a lot of manual entry work, plus it makes it easy to stay current with software updates. You can get integration with Bluetooth too. Various dive computers offer an assortment of features, so it’s best to have answered the above questions and have an idea of what you want. You don’t end up too deep in extraneous gadgets. This is a big one. Wireless gas integration via transmitter is a popular and convenient addon. The best units quickly restore a lost connection. This is basic equipment, so if you need this feature its best to check out reviews before deciding. Some dive computer compasses are far better than others. If you dive using a gas mix, you can have the settings programmed for fast switching. 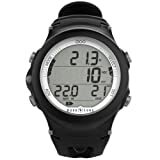 There are different mixes and computer capabilities to match your diving profile. Check out this video for a discussion of the history and other information about dive computers. 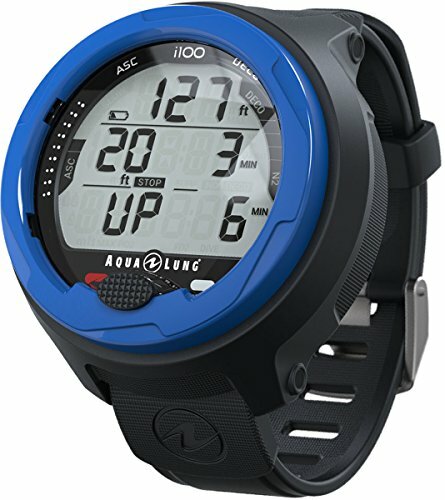 The i100 is Aqua Lung’s most basic dive computer. 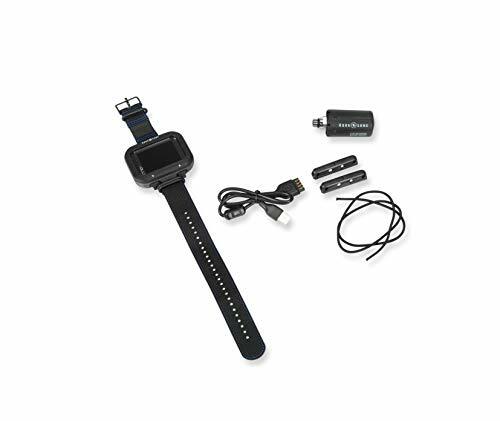 This wrist-mounted unit is a stripped-down model designed for light recreational use, and it establishes a performance standard for the rest of the line. The i100 is lightweight at just over 8 ounces, and carries a buckled strap long enough to fit dry suits. The interface includes a large high-visibility LED display with big letters, and audio for safety alerts. Screens show your status, including no-fly and full desaturation times, and a record of your last dive time made within 24 hours. Measurements can be imperial or metric. The single button menu system is easy to read as it cycles through each set of options. You can choose between 4 operating modes: Air, Nitrox, Gauge and Free Dive. You can program 2 Nitrox gases, which are changeable underwater, and choose between salt or fresh water. 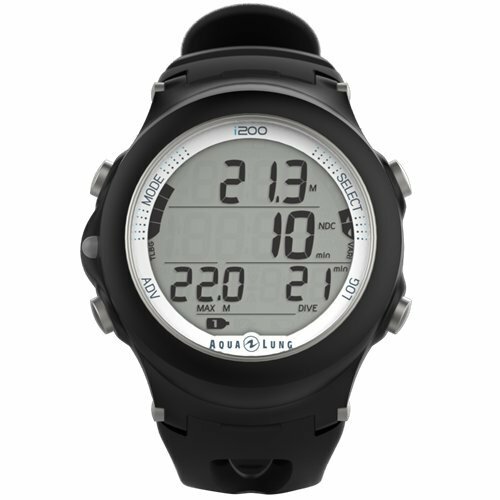 The i100 offers automatic altitude detection, and allows switching between Dive and Free Modes without waiting for a stop period—a convenient feature, though caution should be exercised. The lithium ion battery can be conveniently changed by the user, and offers data retention so you can keep your settings during a switch. It’s a great basic unit with just a few downsides. You can purchase an add-on cable for networking, though options are minimal. The LED display lacks backlighting, so the display can be hard to see without another light source. Bummer. 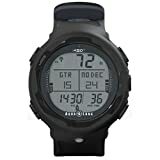 If you’re looking for a wrist-mounted dive computer without a lot of extras, the i100 handles the basic computations that make these devices so valuable. It’s a good basic unit from a premier name. 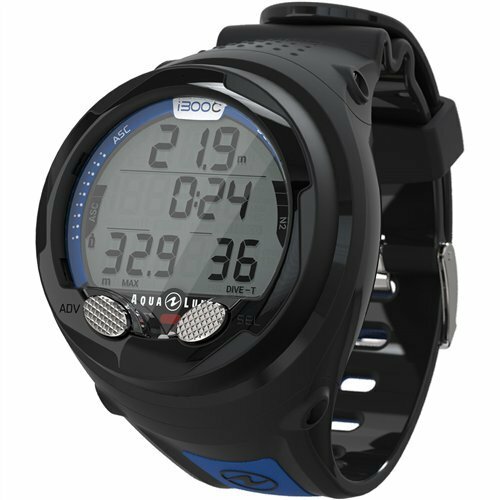 The i200 wrist-mounted dive computer has all the features of the i100 with a beefier performance profile. It can also do double duty as a land wristwatch and receive only complements. The display is smaller than the i100, but it does come with a backlight. The i200 ships out at 9.6 ounces, and has a high visibility LED alarm light. Status information such as depth, dive time, ascent rate and safety stops are easily checked. The straps are an attractive black and have a velvety feel. An extender section is included that lengthens over a wetsuit. The multi-button menu is intuitive—though the manual is not. The graphics-oriented manual has proven unintelligible to some. On the plus side, the battery is user-replaceable and keeps your data alive during a switch. 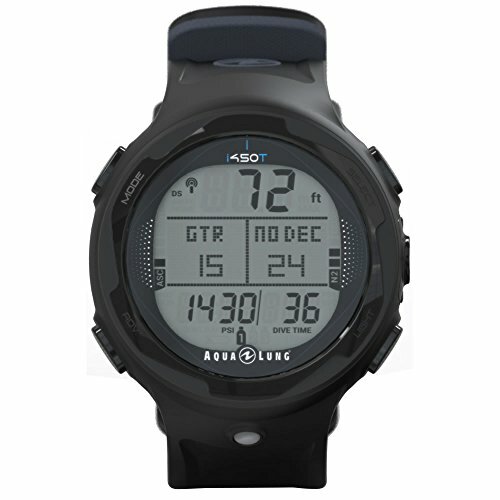 There are 4 operating modes—Air, Nitrox, Gauge and Free Dive. Downloading can be done with the separately-purchased cable. You can also purchase the DiverLog software to view Logs and profile information, and use it to manage your dive computer settings and add photos and other trip details. This is a great entry level dive computer that can handle most recreational needs. It’s nice looking, has reliable performance and is easy to operate. The Aqua Lung i200 and Mares Smart are pretty similar in looks and capabilities. Both are designed to be worn at the wrist. They are not too large so some people can use them as their regular wrist watch too. Both of these dive watches are for recreational divers. They do not offer air integration or other advanced features but instead are easy to use. The feature set on both is very similar with gauge, free diving, air, and gas mixture modes. A slight difference is in the way the devices are navigated. The i200 has four buttons vs the two on the Smart. It’s neither a big advantage nor disadvantage to have more or less buttons as you get used to both. Usually, on a small device like this it can be a little more tricky to use four buttons when you have thick gloves underwater. But in the end it comes down to what you’re used to. They both are affordable dive computers that will keep you safe underwater. With features lining up that closely and pricing being around the same, it’s hard to give a straight recommendation. The Smart is probably a little better established and more commonly found. It’s also available in a number of color combinations while the i200 only comes in black. In the end you can’t go wrong with either of these dive computers if you look for a device for beginner or occasional divers. Both of them can also be used as reliable backup devices should you outgrow their offered capabilities. The newest model on the list, the i300 is great all around dive computer with a few extra features that won’t overpower a newcomer. It takes a step forward in connectivity too. The screen is sharp and clear high-def LED. Backlighting has a whole button dedicated to its use, a radical upgrade of function since the i100. The menu system is straightforward to navigate, with prominent stainless steel buttons. The LED screen is a bit smaller than some competitors, and is slightly less legible than sharper dot-matrix displays. The computer itself is reliable and capable. A Pre-Dive planning feature gives you a safety preview of your dive, and there’s a water activation feature so you can jump in without worry about missing a start. The i300 supports the standard 4 operating modes for Air, Nitrox, Gauge and Free diving, and handles up to 3 gas mixes. You can switch immediately between Free and Dive modes. The battery is conveniently user-replaceable. Where this model should shine is the advertised enhanced connectivity that includes Bluetooth. The DiverLog+ app is free, but you have to pay for the software … and you still have to buy the proprietary overpriced cable for downloading. It’s hard to say this major marketing point is much in evidence. There are other reasons to choose the i300 though. It outperforms many dive computers on the market despite with its recreationally-focused features. It’s the new kid on the block, but with the Aqua Lung name behind it you have a very complete piece of equipment. The i300 may be all you ever need if you’re just starting out and have recreational or light technical goals. It’s clear that both the i200 and the i300C are excellent wrist-mounted dive computers. They both target the recreational diver. The i300C, as indicated by the higher model number, is clearly geared towards a more experienced diver and the needs that come with that experience. It offers better connectivity as well as planning capabilities that the i200 does not have. That does not make the i200 a bad device in any way. It is probably better suited for the occasional diver or as a backup computer. The higher end model on the other hand is a great companion for a diver that regularly is underwater and has more demanding requirements. Take a hard look at your diving needs before you decide between either one. If you’re torn then go for the i300C as it won’t run out of features and options anytime soon while it still can be used by an inexperienced diver. The i200 is a good model but you might ask for more capabilities if you dive a lot. There’s a competent look of solid gear to the i450’s boxy exterior. The attractive metallic housing has a 4-button operation, each placed within raised molding. The little things matter. It wears comfortably due to a specially conditioned inner strap that reduces slipping, chafing and heat spots. Up to 3 Nitrox mixes can be managed with 3 unique transmitters. There’s an easy-to-read, sectioned screen with a crisp dot matrix display in the center area. It is water-activated, and Auto Altitude adjustment is included too. You can add a transmitter for wireless air integration, and the i450 will pair up with a transmitter for life. There’s a visual ascent warning for safety, a built-in compass, and a download cable and strap extender. Pre-Dive planning feature allows a preview of a planned trip. There are potential issues and some quirks. Interestingly, the i450t in black has a PVD (Physical Vapor Deposition) finish and is priced higher than the other colors of blue and white. Also the compass is accurate but a bit small, and a little practice on the surface is advised before relying on it. Some i450 users resort to an analog compass for serious navigation. There’s not much against this model, but some owners have had issues with losing charge quickly. The good news is that the problem appears immediately upon use if it exists, and Aqua Lung is known for taking care of customers. Just pay attention to the warranty period. To ease the odds, the battery is user-replaceable and your data is retained. Since you must know, their DiverLog software is widely panned. It seems the light free version is actually better. If you are interested in download and electronic log book functions, you should probably test this out before committing. Overall this is a reliable machine for experienced divers who want high performance and a great-looking design … or serious new divers who want room to grow. This solid unit also makes a backup able to stand in for a more sophisticated computer if needed. The i550 is a console design that offers the underlying functionality of the standard line. It includes Gas integration and has a notably easy-to-read display. The bold display letters and clean layouts make it easy to check the screen with a glance—but be warned some of the acronyms require the instruction book to understand. There is a simple two-button interface and a straightforward menu. It can handle 3 gas mixes and 3 modes: Air, Nitrox, and Gauge. The battery is user-replaceable and has data retention. The inner workings have the normal safety alarms and an exterior LED for a visual signal. The i550 has a few extra options, including an analog Compass and a quick-disconnect system. You can also purchase their download cable to automate your log entries. The i550 is great if you’re looking for a crisp, legible display. Along with the line’s many safety and performance features, if you’re looking for a console computer, this is one to consider carefully. Aqua Lung’s top of the line dive computer model has all the integral components together with a full-color screen, a replaceable battery, and wireless air integration. It’s a lot for an inexperienced diver to manage, but enough of the settings are optional to make it one to grow on. The wrist mounted unit is basically a small color screen secured with wide comfortable straps: it’s workmanlike and feels great, but it is not made for a night on the town like Aqua Lung’s wristwatch designs. This computer keeps its focus on diving. The screen is a bright, high-visibility (TFT) full color screen, well laid out with a 3-button interface that is easy to learn and navigate. You can easily monitor your information. The LED light signal and low-intrusion audio alarms help you keep things within limits without too much distraction. Aqua Lung’s 4 operating modes are available—Air, Nitrox, Gauge and Free Dive—and can be programmed for up to 3 gas mixes. Hoseless gas integration comes standard on the i770R, and you have the ability to monitor 3 different transmitters. The settings are maintained, so you only have to pair your transmitter once. A download cable is included with the unit without separate purchase. You can also use Bluetooth to transfer data, and can purchase the DiverLog+ app to manage your logs. It all comes professionally wadded into a hard carrying case. There’s a bungee and a trendy NATO wristband too. The two main negatives of the i770R are lack of display visibility in sunshine, and issues with poor battery life. The color screens are great when out of the sun, but there is some washout in direct light. This isn’t an issue with the unit so much as with the technology, and simply shielding the display is annoying but it works. Color screens are a power drain, but concern about battery-life is moderated by the fact the CR batteries used by the i770R are common, cheap and user-replaceable. Rechargeable CR’s are also available. Aqua lung is a famous name, and they have fulfilled expectations with their comprehensive line of dive computers. The company acquired know-how from the foremost maker of quality consumer dive computers, Oceanic, and have put their safety-first recreational stamp on the underlying designs with positive results. 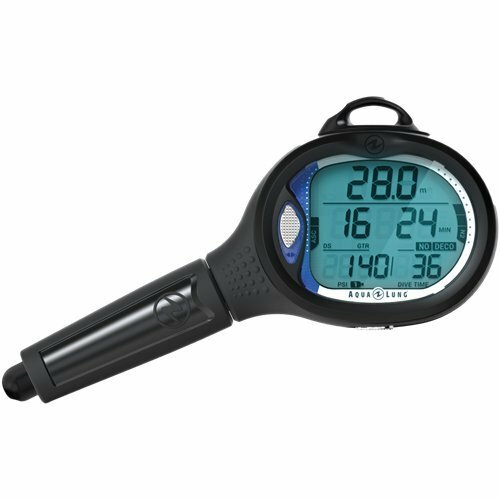 The target audience of Aqua Lung’s dive computers is serious recreational divers, and their line meets the requirements of reliability and convenience. Whether you are a newcomer or a more experienced user that doesn’t use decompression, there are a lot of choices in the Aqua Lung line up. All Aqua Lung i-series dive computers employ the same conservative algorithm, which makes it easy to buddy up with, or to use as a backup. You might even find yourself using an i-series unit as a backup computer for more technical trips.